The floral brooch features full-cut diamonds weighing a total of approximately 2.95 carats, enhanced by baguette-cut diamonds weighing a total of approximately 1.35 carats, accented by single-cut diamonds weighing a total of approximately 0.55 carat and marquise-shaped diamonds weighing a total of approximately 0.35 carat, completed by step-cut rubies weighing a total of approximately 1.50 carats, set in platinum. Total diamond weight is approximately 5.20 carats. Gross weight 35.80 grams. Condition Notes: Because you always deserve flowers. Brooch tests as platinum. Completed by a 10k white gold pinstem and catch on the reverse. Many diamonds fall in the VS clarity range. The rubies and diamonds have chips, nicks, and/or abrasions on facet junctions. Circa 1950. 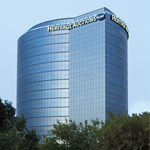 One diamond is currently missing--Heritage will have replaced before delivering to the winning bidder.